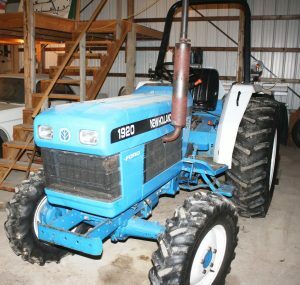 FORD-NEW HOLLAND TRACTOR – NEW HOLLAND MOWER – TOOLS – HOUSEHOLD ITEMS | Lawson & Co.
Due to the death of Emma Alkire, the following personal property will be sold at Public Auction. Directions to Auction Site: From I-70, take the Little Point Road/Co.Rd. 1100 West exit. Go north on Little Point road/Co.Rd. 1100 West approx. 1 mile to Appaloosa Road. Go west on Appaloosa Road approx. 0.7 miles to the property (please follow signs). To sell at approx. 11:30 a.m.
Auctioneers Note: LAWSON & CO. is also offering the Emma Alkire Family Trust 70+ acre farm at public auction on April 27th at 10:00 a.m. Please go to www.lawsonandco.com for real estate auction information. Order of Sale for Personal Property Auction: Two auction rings will be going at the same time beginning at 10:00 a.m: Auction Ring #1 will be offering household furniture & appliances followed with primitives & collectibles; Auction Ring #2 will be offering box lots & miscellaneous. Tractor, mowers, & equipment will sell at 11:30 a.m. Bring a friend so you don’t miss a bargain! NO BUYER’S PREMIUM & NO SALES TAX!